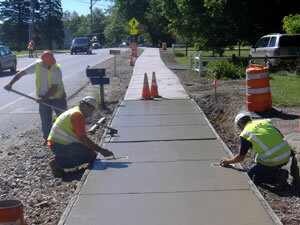 3 Sidewalk Grants Recommended for Approval! Anita Avenue – from Castro Valley Blvd. to Somerset Ave.
Stanton Avenue – from Castro Valley Blvd. to Miramar Ave. These are three of only ten bay area projects to be recommended for funding in this highly competitive program. In addition, the Somerset Avenue grant proposal is on the “contingency” list of projects that could receive funding if any of the winning projects don’t go forward. We have much to be proud of! This funding is for the initial design phase of each project. It is highly likely that these projects will be fully funded throughout the remaining engineering and construction phases over the next few years. A big thanks goes out to Paul Keener, Sr. Planner for Alameda County Public Works Agency (PWA) and his colleagues, Alameda County Supervisor Nate Miley and staff, Castro Valley Matters, and many members of the BikeWalkCV team who spent countless hours on this campaign, starting with the first Castro Valley Town Hall meeting a year ago through assisting with writing seven extensive grant proposals. We look forward to keeping the momentum going as we continue our call to action for more safety and accessibility for walking and biking in Castro Valley.